Whether a stuffing is a dressing, or vice versa, is as much about semantics as whether it is cooked inside or outside the bird. One thing that is certain, both are tasty, fragrant, comforting and satisfying; accompaniments with a balance of texture and taste that complement the bird and pay compliment to the cook. While recipes for many holiday dressings tend to build on bread, plenty call for grains like rice (wild or tame), or even cooked chestnuts as a primary foundation. A dressing also presents you with an opportunity to add a few choice ingredients that can elevate the level of your meal, or step up to an elaborately prepared gourmet bird. Several recipes take advantage of the bounty of autumn and fall harvests, and include fresh ingredients such crisp apples and pears, wild chanterelle and black trumpet mushrooms, and various truffles like the White Alba and Winter Black varieties. If your dinner is a more formal affair, another grand way to stuff or accompany a bird is with a loose dressing, not based on or bound by starch at all, or with forcemeat such as chicken mousseline. For a full-on gourmet departure, fill your bird with a simple loose dressing of just a few choice yet intense ingredients; for example fresh Wild Boar Sausage and minced bits of turkey liver sautéed with prunes plumped in black tea, and golden raisins darkened in port – of course, with the port thrown in. For a true delicacy, consider a boned bird or turkey breast filled with a duxelles of fresh wild mushrooms or beautiful pieces of foie gras incorporated into a chicken breast mousseline. 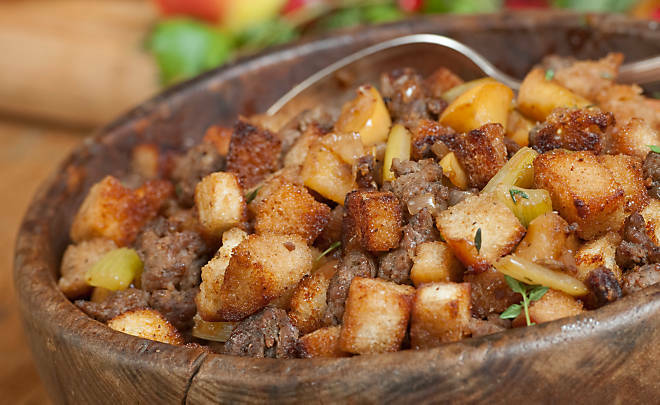 For our take on the traditional bread stuffing, try making this Wild Boar Sausage with Apple Stuffing. The wild boar sausage has a hint of sage that is perfect for Thanksgiving, and tastes just enough like traditional pork sausage that finicky eaters will not have word of complaint. 1. In a large sauté pan, melt butter over medium heat. Add celery and onion and cook until soft and translucent. Break up sausage meat into small chunks (about the same size as the bread cubes) and add to the pan. When the sausage is cooked through, add the apples, sage and broth (or water). Bring to a simmer. 2. Place the bread in a large mixing bowl and pour the cooked ingredients over the top. Mix thoroughly to moisten all of the bread. Test seasoning and add salt and pepper to taste. Bake in a covered casserole until completely heated through and starting to turn golden brown on top and around the edges. 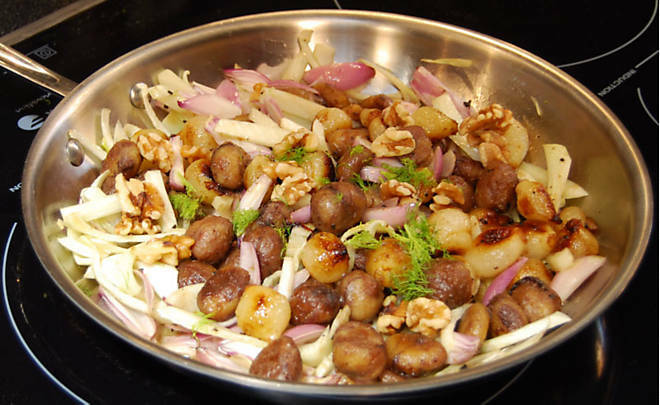 More in the category of dressing, this recipe for Sauté of Chestnuts, Walnuts, Fennel and Onions is inspired by the cuisine of Joël Robuchon, and adapted from Patricia Wells’ book Simply French. Ariane loves to make it with our already-prepared chestnuts, black truffle butter and demi-glace, as you will see below. 1. Melt 1 tablespoon of butter each in two medium sauté pans over medium-high heat. Add the onions to one and the chestnuts to the other and cook, stirring frequently, until the onions and chestnuts have started to turn golden brown. Season with salt and pepper and sprinkle each pan with 1 tablespoon sugar. Continue cooking the vegetables, stirring frequently to prevent burning, until evenly glazed and caramelized. Set aside. 2. Melt 2 tablespoons truffle butter in a large skillet over high heat and add shallots. Season with salt and pepper and cook until the shallots are translucent, one to two minutes. Add fennel and cook for another couple of minutes, stirring frequently, until the fennel and shallots have started to color. Adjust seasoning with salt and pepper, if needed. 3. Add glazed chestnuts and onions to the pan with the shallots and fennel and cook everything together for another minute or so. Adjust seasoning with salt and pepper and add demi-glace by the tablespoon-full if the mixture seems dry. You may not need the demi-glace. Stir in walnuts and reserved fennel fronds and serve.